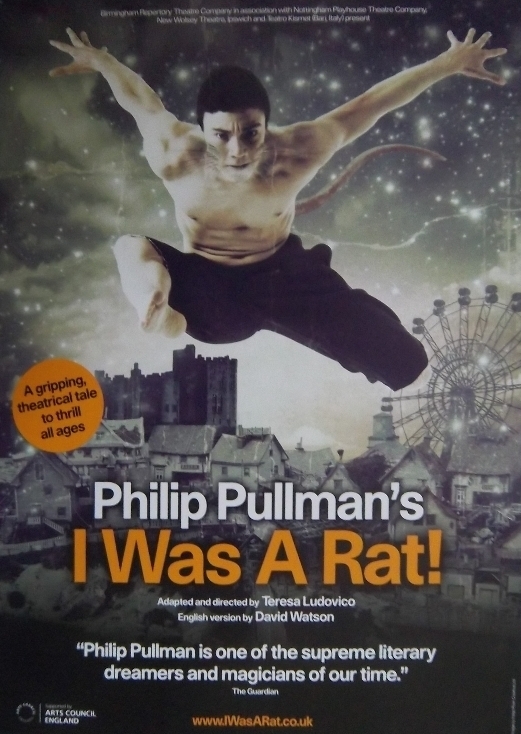 Currently touring the United Kingdom is I Was A Rat!, a stage play based on the book by British author Philip Pullman. Pullman's 1999 book opens with elderly couple Bob and Joan answering a knock at their door, and finding a boy in a tattered page's uniform. When asked who he is, the boy can only tell them, "I was a rat". Having no children of their own, Bob and Joan take the boy in and name him Roger. They soon find he has distinctly ratty behaviour - he cannot eat with a spoon and, on his first night, chews his bed linen to shreds. Bob and Joan attempt to find Roger's parents, but find the authorities disinterested and unhelpful. After Roger runs away during an examination by the Philosopher Royal, he gets exploited as a sideshow freak, used as an assistant to house-breaking, and eventually takes refuge in the sewers. With the local newspaper The Scourge feeding the hysteria, he is eventually caught and, as "the monster of the sewers", put on trial for his life. I recently attended a performance at the Liverpool Playhouse. The stage play follows the book fairly faithfully; it was extremely well done, and I had so much fun watching it that I returned to catch it a second time before the production moved on to their next venue. Bob and Joan are played by Tyrone Huggins and Lorna Gayle, who convincingly portray a couple long-married but still just as fond of each other as the day they wed. Roger is wonderfully played by Fox Jackson-Keen, best known for his previous performances as Billy in Billy Elliot the Musical. (For those that are wondering, his vulpine name comes from having a father who is a big fan of The X-Files.) Trained in gymnastics and dance, Jackson-Keen's skills are put to good use in I Was A Rat!, as Roger dodges and somersaults with rodentlike agility. The three main characters are surrounded by a talented ensemble of five actors (Christopher Dingli, Dodger Phillips, Jack Jones, Joey Hickman, and TJ Holmes) playing a multitude of minor roles (policemen, various officials and politicians, newspaper reporters, school students, etc). This requires continuous wardrobe changes over the course of the story, showing off the production's eye-catching and imaginative costume designs. The costumes are at their most colourful and spectacular when Roger is exhibited at Tapscrew's circus, and the cast portray a bizarre assortment of grotesque sideshow attractions. Furries will definitely enjoy this tale of a rat become human, especially those moments where we see three members of Roger's (untransformed) rat family. The rats' costumes are very simple - rat noses and overalls with rats' tails hanging out the bottom - but they are surprisingly effective in the dim lighting used whenever the rats are present. Twin lamps on the sides of their heads do a good job of suggesting eyes glowing in the darkness. The rats are present in one of the play's most touching scenes, as Roger (emotionally played by Jackson-Keen) cowers in the sewer begging to die. Roger's rat brothers creep near and gently nudge him to his feet, while his mother tells him that she misses him but he has to go and live his new life as a boy. Oh, and one actor appears on all fours as a police dog, wearing a uniform and marching in time with his human handlers. All in all, I Was A Rat! is a lot of fun for both adults and children alike. As of the time of writing, it is playing at the Nottingham Playhouse, and will be touring various cities in England until the beginning of June. More information can be found on the tour's official website, or Twitter. Seems interesting. I've read the book (of course).